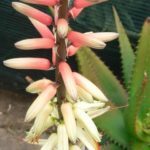 Available From: Sunbird Aloes Wholesale Nursery, Randburg. 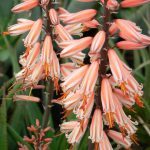 Very large and showy, this slow-stemming aloe cultivar is capable of a massive flower display, usually in early winter, when up to 6 well-branched, simultaneous inflorescences open their large, bright orange flowers. 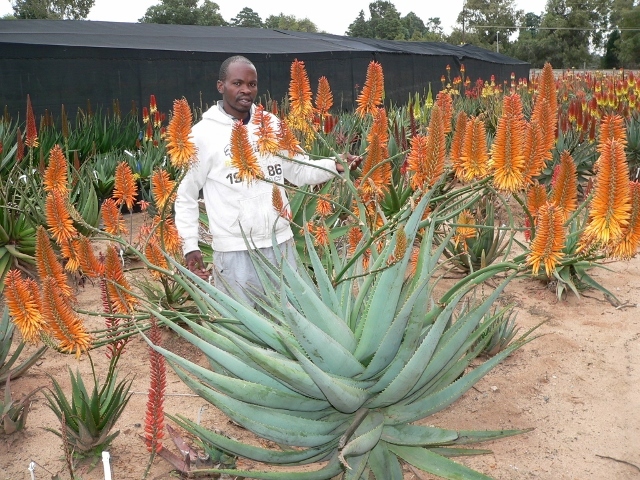 The near-upright racemes are spread over the canopy of the plant in what must rank as one of the most spectacular sights in any aloe garden. From end to end the racemes from one rosette can measure more than 3 meters across! The plant has a large rosette of grey-green leaves lined with pale spines. The odd stem shoot that may appear is best removed in the interest of retaining a balanced plant shape. Fully developed plants may divide their rosettes. ‘Abundance’ is a plant for the open rockery where it should be given ample space to display its wares. 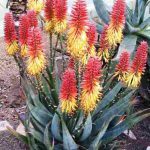 It is a feature plant ideal for landscaping. It needs plenty of compost in the soil. To sustain the annual flower show a mulch of kraal manure or other organic fertiliser during the growing season is a good idea.